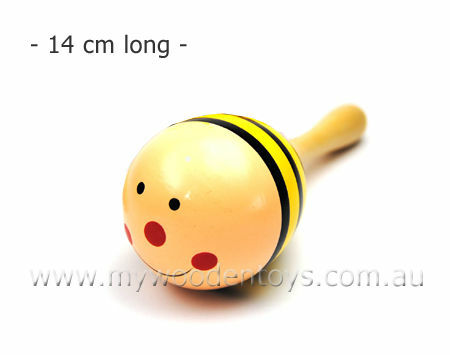 Mini Wooden Bee Single Maraca is a single beautiful yellow and black striped wooden maraca with a lovely smiley face. This shaker has a lovely gentle sound and is an ideal size and weight for little children. This Maraca is perfect for 18 months plus and has a lovely natural handle and stripy spotty shaker. The gentle noise of the shaker means this is a great first musical instrument or just as a rattle. The price above is for a single maraca. Please note that this maraca has a yellow felt round attached to the handle. This is a safety feature to stop the handle being placed in the mouth. We like this because: "Sweet strong and colourful. Gentle sound wont drive you nuts!"